Clean lines and stark contrasts make up the low-profile design of the Arlo Television Stand. Supporting a flat screen television up to 55 inch, this stand is ideal for smaller, modern or industrial spaces. Finished in a natural Tan Walnut finish, with the appearance of true wood grain, Arlo brings a rustic appearance into an industrial-chic design.Compatiable with a 26 inch Dimplex Electric Fireplace, Arlo stunningly displays a traditional or contemporary look with either an acrylic ice or inner-glow log media bed. Sporting dual open cabinets, each with a single, adjustable shelf, the Arlo Electric Fireplace has an abundance of space for all your dicor or media needs. 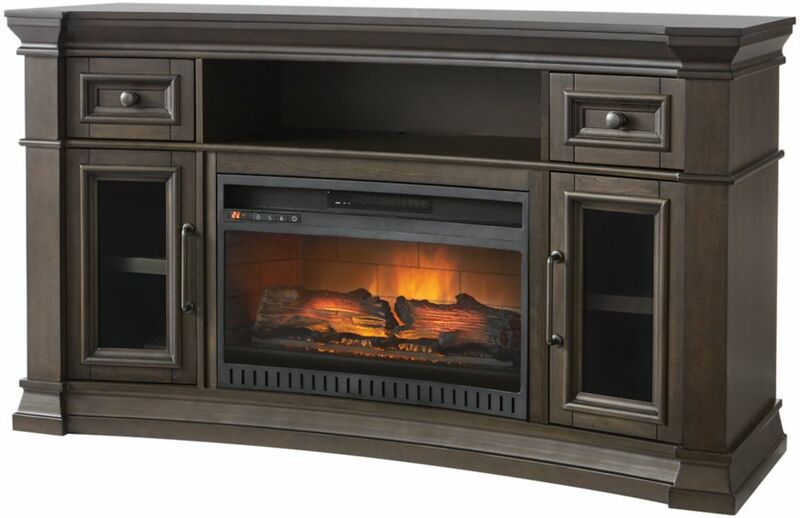 Display your electronics in style with the clean-cut, low profile Jesse Electric Fireplace Television Stand. Featuring cord management, a single adjustable shelf in each cabinet, and a center showcasing a 26 inch Dimplex Electric Fireplace. Ideal for contemporary media rooms, Jesse complements the space with it's robust, block construction, Grey Iron Mountain finish, and reversible door panels. Whether you're looking to maintain a neutral color palette or add splashes of eye-catching color, Jesse conforms to your personal style and presents your media your way. With traditional stylings, and steel netting door panels, the Xavier Electric Fireplace Television Stand exudes farmhouse charm. Showcasing a 23 inch Dimplex Electric Fireplace, with either an inner-glow log or acrylic ice media bed, the contrast against the warm Grainery Brown finish is the perfect addition to a traditional living room or family cottage. Supporting a flat screen television up to 50 inch, with a single adjustable shelf in each of the two media cabinets, the Xavier offers plenty of room to display electronics or dicor items. No matter where you hang your hat, the Xavier Electric Fireplace brings the charm of small-town living home. This stunning 45" Mantel Electric Fireplace enhances your living room space. The contemporary design media console mantel is sure to add sophistication to any room. Premium semi-gloss white finish mantel with faux marble surround and top features crown molding with a step-out beveled face panel, includes removable corner leaf. Features adjustable shelving to fit your components and a cable management system. The mantel comes with a 24 electric fireplace inserted, which can be used with or without heat for all season. The unit efficiently heats up to 400 sq. ft. It boasts 5 flame brightness options and 2 heat modes Eco and Instant to let you adjust the level of light and warmth to your liking. The control panel makes operation easy, and it even comes with a multi-function remote control for operation from across the room. 60-inch Concave Media Console Electric Fireplace in Coffee Finish is rated 5.0 out of 5 by 1. Is there glass on the fireplace section? Yes, the front area where the logs/flame feature is visible has tempered glass. The unit is 120V and produces heat similar to a hair dryer. It will provide supplemental heat up to about 400 sq ft. The unit has been tested for a weight capacity of 135 lbs (which is more capacity than most flat panel TV's).